Choosing the proper population on corn will help you maximize yields and protect your bottom line. Our old recommendation was to plant a maximum of 30,000 seeds/acre on better soils. We will increase that recommendation to about 33,000 seeds/acre for better soils. But, as our own data shows, picking the ideal seeding rate can be a bit of challenge. Available water has a huge impact on the ideal seeding rate. In 2008, a year that was very dry, the ideal population for corn was less than 20,000 seeds/acre, well below our current recommendations. Our yields barely reached 120 bu/acre and we felt really stupid about growing corn. In 2009, a year with timely rains, the ideal population for corn was at least 45,000 seeds/acre, well above our recommendations. Our yields rose above 300 bu/acre and we felt really smart. However, the only major difference between the two years was the amount and timeliness of rain. In both years, we used the same four hybrids, the same soil type and the same fertility. (If I told you that we got 300 bu/acre of corn with 160 lbs N/acre, no one would believe me. So, I'm not going to say it.) When you "average" the two years together, yield was maximized at about 35,000 seeds/acre. Both of these years were extremes and we rarely advise farmers to make decisions based on the extremes. Even more evidence about the influence of water on seeding rate comes from a study we conducted in 2007 at the Woodford County Farm. The rainfed corn reached a maximum yield at about 30,000 seeds/acre where the irrigated corn reached maximum yields above 40,000 seeds/acre (Figure 2). The irrigated corn received water at rates that were probably too high for most traditional sprinkler irrigation units to deliver. Five years of research on a Maury silt loam suggests that maximum yields are reached at about 30,000 to 33,000 seeds/acre (data not shown). So, if water is not limiting, then much higher seeding rates may be suitable. 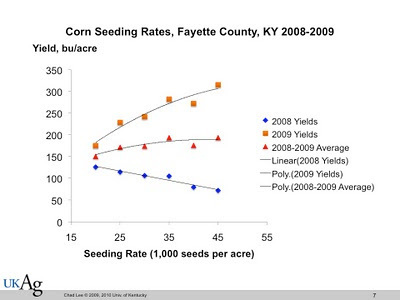 However, most years in Kentucky, water is our limiting yield factor. Our soils are relatively shallow and can hold just a few inches of water at a time. Almost every year, we go through a period of two to three weeks with no water and high temperatures during seed fill. It is this period that probably does more to limit yields than most other factors each year. As we see more and more center pivots come into Kentucky, I think we need to do some more investigation in this area. Again, the center pivots will not irrigate as well as our small-plot system. But, these center pivots can help farmers avoid extremely dry weather. If farmers have an interest in running some strips as high as 40,000 seeds/acre, I would be interested in talking with them. For the vast majority of acres without irrigation, a maximum seeding rate of 33,000 seeds/acre on better soils does a good job of avoiding the extremes. Figure 1. Yield response of four hybrids on a Loradale silt loam soil, Lexington, KY. Figure 2. 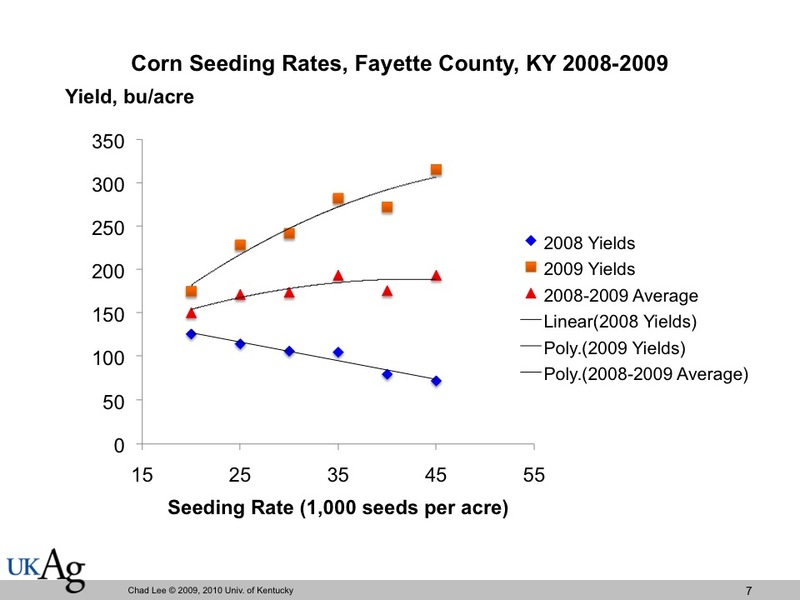 Seeding rate study on a Maury silt loam, Woodford County, KY, 2007.